On today stage performance, NGT48 new theater manager Hayakawa Maiko apologizes over Yamaguchi Maho's incident. Maiko adds, police are still investigating the case with checking all of the facts and witnesses. As we previously reported that NGT48 to resume all of their on-and-off air activities after the case closed no later than next month. AKS hopes not a single member involved in Mahohon's incident and wants to protect all of their members in 48 Group in the future. 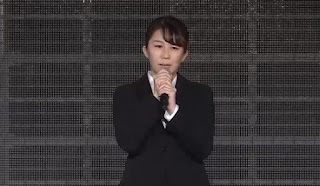 Despite out of the 40 NGT48 girls "several" (8) of them are/were reportedly hooked up with wotas, the management even requested all members to report on them, but this is unrelated to the incident.